Chartered by the Holy See in 1887, the Catholic University of America is the lone institute of higher education under the care of the US bishops, who exercise their oversight through the DC school's board of trustees, led by its chair. Given the university's ever-increasing prominence over recent years, it's worth noting that, earlier today, its trustees elected Archbishop Allen Vigneron of Detroit -- a recent high-profile appointee of B16's, and a double alum of the Brookland campus -- to CU's top office earlier today. 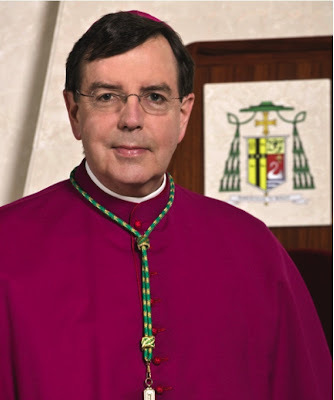 In the post, the 60 year-old -- sent home to the Motor City in early January -- succeeds Bishop William Lori of Bridgeport, first elected to the post after its prior longtime holder, Cardinal Bernard Law, left the board following his resignation as archbishop of Boston in late 2002. "The Very Opposite... of the Love of God"
In Philly, Senior Makes Four... Again. "And, Yea, Though I Walk...."